I. Am. Beyond. THRILLED to announce that Enchantmentsl.com will open in just two days! 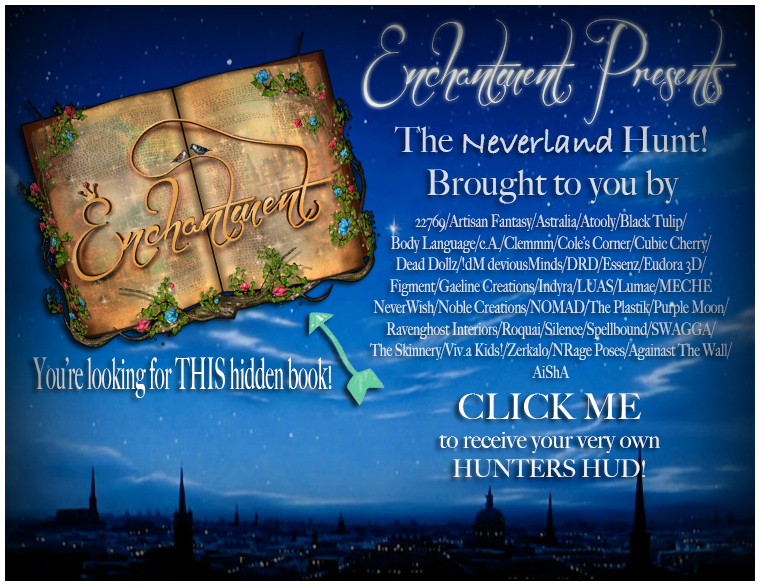 With over 90 incredible vendors with items all inspired by Peter Pan & Neverland! As this will be my first official Enchantment post, I thought I’d feature two of my oldest friends in Second Life. Bee Dumpling of The White Armory made this incredible nightgown inspired by Wendy from Peter Pan. Not only is it a stunning gown but as always the textures are perfection. The top is applier based with several applier options and the skirt is 100% Mesh, in standard sizes. It’s such a lovely little thing and available in a variety of colors. I’ve been a friend and long time fan of Bee for over 6 years, so it’s a pleasure to have her participate in Enchantment. Next we have Kol. Now, Kol and I were both leaders and Role Players in the SIM I created alongside my buddy Annie. Mystara was our home and together we RPed and went all silly! However, Kol isn’t just a superb RPer. No. She’s an incredible Designer and if you’re a mermaid in SL, then you have one of her tails. For the last round of Enchantment Kol made an animated Rock scene inspired by The Littler Mermaid and going along with the theme she’s made another rock scene from Peter Pan. Remember? When the Mermaids tried to drown Wendy? Yeah. It’s hilarious and amazing. Enchantment opens in two days and with it the Enchantment HUNT is back! With 39 awesome designers giving out free exclusive goodies! I can’t wait to show ya more!